Full-text articles are available online and in print. Here are the various ways to get to full text articles available from the Furman Libraries. 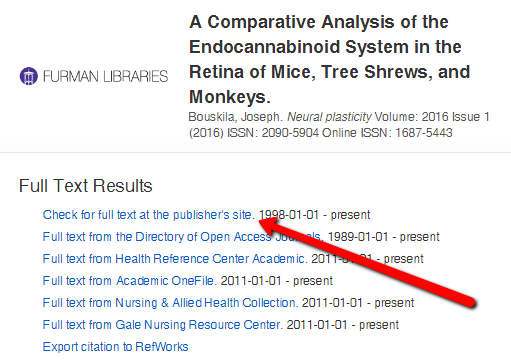 If you are looking at the article citation in a database, look for a PDF icon or the FUll Text icon. Clicking on the FUll Text icon will automatically start the search process below looking just for that one article. If the full text is available online, you will be provided with a link to the correct database. Often this will take you directly to the article. **Note: There is often more than one Full Text from . . . link. Any of the links should take you to the article. Some articles - particularly in the sciences and psychology - may be found in a resource called ScienceDirect. If it is, the option to "Request full-text from Get it Now (for students and others without a ScienceDirect account)" will appear. Follow this link and use your Furman email address to complete the request. If we don't have it online, Interlibrary Loan will get a copy from another library or from our print collection. 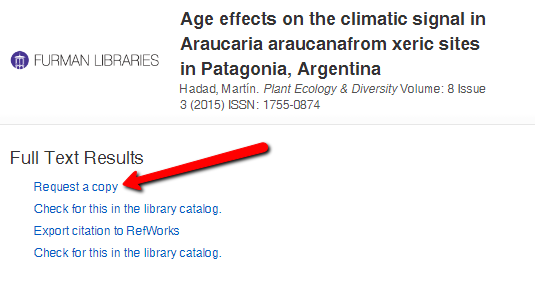 Clicking this link will populate a request form with the citation information for this article once you login to your account. Know the article you are looking for? For all available citation fields, try the full Citation Finder. If you know the DOI, that's all you need!